words by Alastair, photos by Mike. 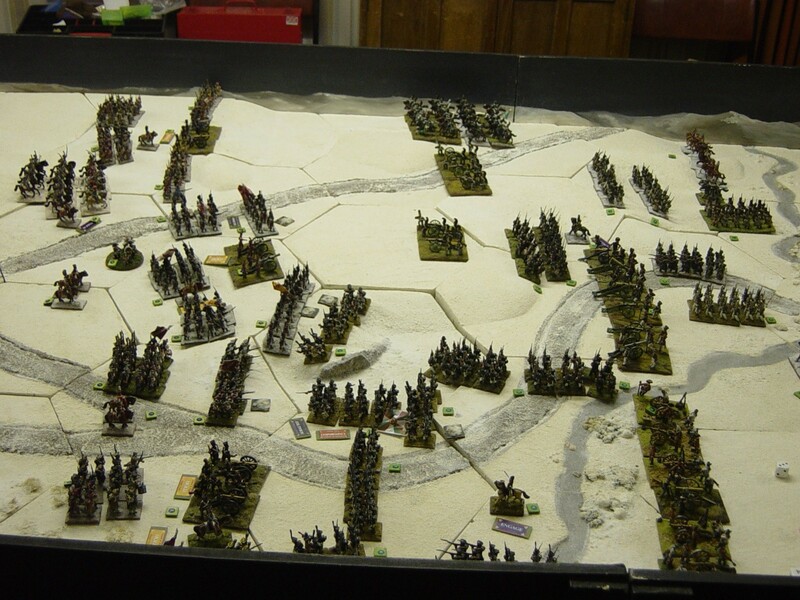 OWG’s Sunday Game on 8.2.15 was Studyanka, the rearguard action on the east bank of the Berezina. The object for the Russians was to seize the bridges before sunset. 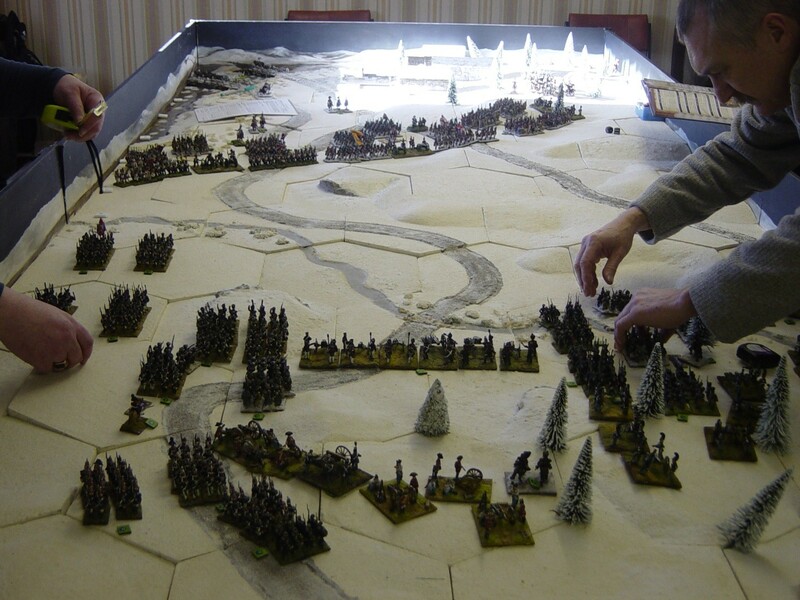 We used General de Brigade rules that had been used in a previous refight of the scenario. That refight chalked up a victory for the French but at high cost and like the historical battle, a cavalry action put an end to Russian hopes. This time the forces were at full strength. From Count Wittgenstein’s 1st Corps, 15,000 Russians were pitted against 7,400 troops from Victor’s IX Corps, almost entirely Germans and Poles. Wittgenstein chose to remain at Borisov with his other troops and the force was placed under the command of Major General Vlastov of the Advance Guard. It soon became clear that the Russians were going to find it difficult to make their superiority in numbers tell. The French deployed on the ridge east of the village with their cavalry sheltered rear/left. Off-table on the west bank, twelve 12 pounders from Napoleon’s Reserve were poised to enfilade any Russian units that hugged the river bank too closely. On the Russian side, MG Vlastov prepared to engage on the left, while GM Berg crossed the stream. In the Russian centre, deployed on the slope overlooking the ford, is the 12 pdr battery that began firing at long range. Vlastov decided to move it closer to effective range but that was an error; the limbered guns proved to be a hindrance and would have been better left alone. Kulniev’s Brigade attacks. In the foreground, the St Petersburg Militia march behind the Navajinski Infanty regiment. The brigade artillery pounds at the French right. When the order changes from ENGAGE to ASSAULT, two battalions of Jagers attack in massed columns on the extreme right of the French line. The attack looks promising but it falls into disorder, because the columns are too close to each other. They cannot get to grips with the enemy. The assault grinds to a halt. Above is the situation near the end of play. On the Russian left, Kulniev fails to change his orders to reform his brigade and renew a bombardment. The 12-pdr battery is at last preparing to unlimber but its position is far from ideal. On the right, a Russian threat is prepared with artillery. In the rear reserves whose position is noted have not been committed to a sector of the battlefield yet. They are a mixed bag of twenty units that include Grenadiers and Guard Cavalry drawn from the depots as well as militia and Cossacks. The absence of Wittgenstein and the rules for changing orders exposed the inefficiency of the Russian command. Also brigade orders require 50% of units to follow the conditions and some Russian brigades were difficult to handle with this restriction. For example, the reinforced Advance Guard brigade resembled a miniature army, comprising two battalions each of line infantry and Jager, two regiments of Dragoons, two batteries of artillery and a unit each of Cossacks and militia; finding a suitable order might be difficult. Russian brigades may seem large compared with other nationalities. 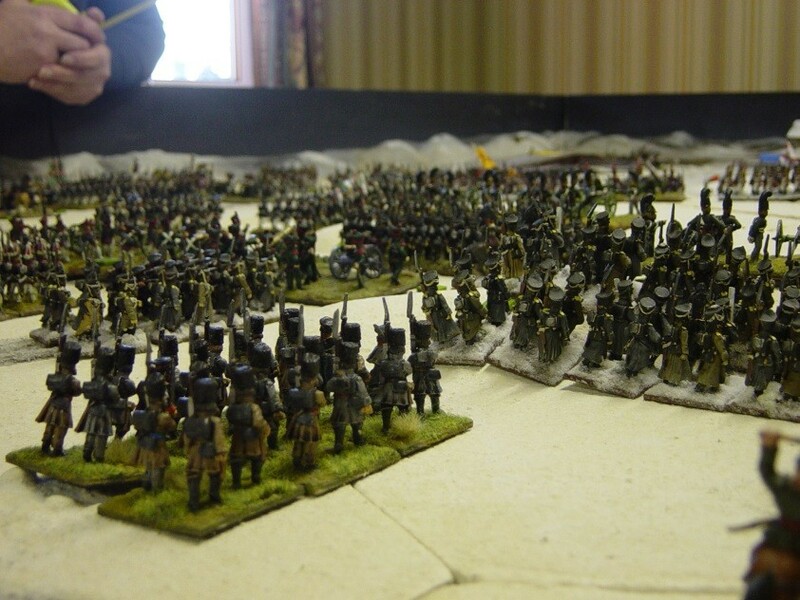 Berg’s brigade comprised 8 units of Line Infantry, 3 of Jager and militia and two of artillery.